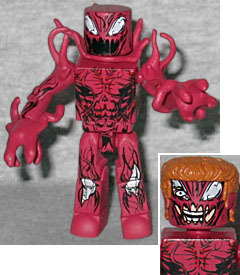 The first Carnage Minimate was released in 2003's Series 2. The second Carnage Minimate was released in a 2014 box set exclusive to Luke's Toy Store. So putting this one in the mass market series is very welcome! This is the modern Clayton Crain design, which is all stretchy and drippy and gross, like an illustration from Scary Stories to Tell in the Dark. This figure uses several of the parts from the LTS exclusive, including the hands, upper arms and neck frill, but not the weapon arms. The detailing on the paint is intricate, even continuing on the top of his head. A bit of silver peeks through at his knees, reminding us of the time the Sentry ripped him in half. The set includes a half-Carnaged head, which shows us Cletus' mouth and right eye, as well as his red hair. 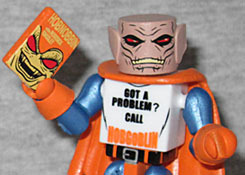 Wow, this is only the second-ever Hobgoblin, and the last one was an exclusive (and also the first Minimate to ever have an on-package bio, something we take for granted nowadays! This is the classic design, not the new one, with the orange tunic and the light blue limbs. His hood and cape are new, while his satchel and pumpkin bomb are old. He also has a purple glider and an exhaust fight stand. The set includes an extra head. It has sculpted ears and is presumably meant to represent Hobby with his hood off, but in that case, why is it a different design and color than his usual face? There's also a second torso, wearing the white "Got a Problem? Call Hobgoblin" slogan T-shirt. Considering that he wears the shirt under his cape, it's too bad they didn't print the "Orange You Glad I'm No Longer Bad?" slogan on the other side and make it reversible. 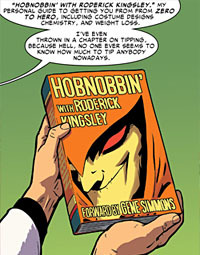 Finally, we get a copy of his book, Hobnobbin' with Roderick Kingsley, with a Minimatized version of the cover seen in the comic. Both the figures in this set are done really well, and both characters have been criminally overlooked when it comes to Minimates. How can you go wrong! No OAFE update in my mailbox this week?!?!?! That's it I'm going to my bunker, cause it's the end of days!!! !